VATICAN CITY (CNS) — The Catholic Church must be welcoming and creative in finding ways to not let people’s physical, psychological or intellectual limitations keep them from encountering God, Pope Francis said. “The church cannot be ‘mute’ or ‘tone deaf’ when it comes to the defense and promotion of people with disabilities,” he told differently abled individuals, their families and pastoral workers and professionals who work with them. Words and gestures of outreach and welcoming must never be missing from any church community, so that everyone, particularly those whose journey in life is not easy, can encounter the risen Lord and find in that community “a source of hope and courage,” he said Oct. 21. 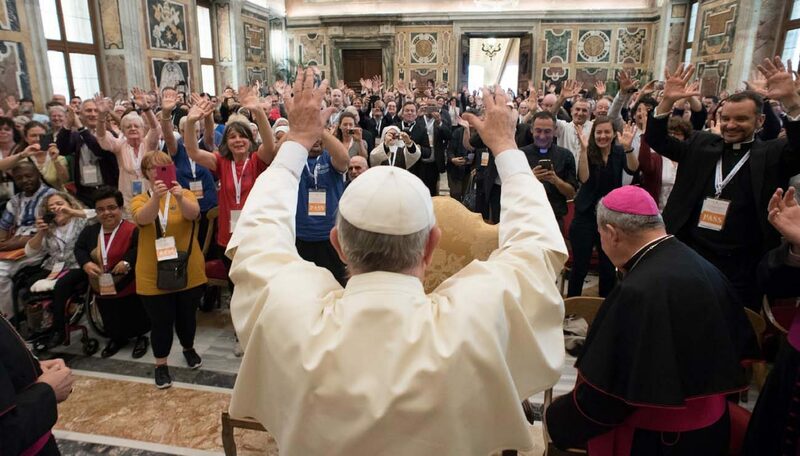 The pope spoke during an audience with 450 people taking part in a conference sponsored by the Pontifical Council for Promoting New Evangelization. The gathering Oct. 20-22 was dedicated to sharing best practices in engaging and catechizing persons living with disabilities — a topic Pope Francis had specifically asked the council to look into, conference organizers told Catholic News Service. However, attitudes that are often “narcissistic and utilitarian” still abound, marginalizing people with disabilities and overlooking their human and spiritual gifts, he said. Also still too pervasive is an attitude of refusal of any potentially debilitating condition, believing it would be an obstacle to happiness or the full realization of oneself, he said. But “in reality, all of us know many people who, even with their serious frailties, have found — even with difficulty — the path of a good life, rich in meaning,” he said, and “we know people who are outwardly perfect” yet full of despair. “It’s a dangerous deception to believe in being invulnerable,” he said, since vulnerability is part of the essence of being human. Two participants from the United States, who were part of the conference organizing committee, and a father of a young woman with Down syndrome told CNS that the usual approach of “special programs” for people with particular needs should change because they can become a form of segregation. For example, Sister Kathleen Schipani recalled how dark and lonely it was going to an empty school late every Wednesday night for a parish program meant for children with disabilities. Sister Schipani, who leads the office for persons with disabilities and the deaf apostolate at the Archdiocese of Philadelphia, said the model they are pursuing is to have one parish religious education program for everyone, but with options for smaller breakout groups, one-on-one instruction or other methods that can address individuals’ particular needs. Janice Benton, executive director of the National Catholic Partnership on Disability based in Washington, D.C., said too much focus on providing special programs also has meant some people get turned away from their neighborhood parish because the church doesn’t have a program accommodating a specific disability. “The first thing is welcome the person,” she said, and speak with them; the church is more than a collection of programs, it’s about relationships with each other and with God. “It’s not so much having the skills or having the professionals, it’s knowing the person and then just an ordinary way of expressing how they belong to the church” in catechetical formation, participating in the liturgy in some way or parish activities, said Sister Schipani, a member of the Sisters of the Immaculate Heart of Mary. Also, a policy for creating media should be that it is planned from the start with everyone in mind, so that a video, for example, has both visual captions and audio narration since digital platforms “can get less accessible” if they rely too much on one style or format, said Benton. Not only do people with disabilities miss out on support and the sacraments, the whole church community loses by not including their differently abled brothers and sisters in Christ, said Blase Brown, whose 31-year-old daughter, Bridget Mary, runs ButterfliesForChange.org and is a public speaker about life with Down syndrome. “The gifts she has to share, particularly at the level of her faith” he said, are “an untapped, beautiful” resource. The question he always asks, he said, is why don’t dioceses put more focus on “how day-to-day parish life, religious education, schools, liturgy” can include people with various disabilities rather than come up with activities that sideline them. There might be some disruption or distraction when people with disabilities are more widely welcomed, he said, just like when a baby cries from the pews. “This is who we are, we are people. This is living. This is life. Everybody belongs at the table and sometimes somebody is going to be disruptive and you deal with it,” said Brown, who lives in the Diocese of Joliet, Illinois. Sister Schipani said priests can make all the difference by setting the tone and the example for the rest of the parish. Priests can talk “from the pulpit” and parish bulletins can explain about being welcoming, patient and comfortable with families with children and adults with disabilities. Ushers, too, can help by “modeling really wonderful ways of welcoming and including and giving people choices” about seating arrangements, she added.